Sharon is casual, but with a pearl necklace! A set of pictures over at the Daily Mail caught my eye a few days ago, showing Sharon Stone wearing a casual outfit that I liked—taupe cable knit sweater, denim, taupe suede boots, a fantastic tote, and sunglasses. What also caught my eye was her pearl necklace! I love pearls and wear my Mikimoto pearl studs fairly often, but I seem to have a harder time wearing a pearl necklace on a regular basis. I think some part of my mind still has pearls in the to-be-saved-for-special-occasions category, which is ridiculous. I love the unexpected look of them here on Sharon and the casually glamorous way she wears them! I love this pearl necklace on Sharon, as well as the sunglasses. 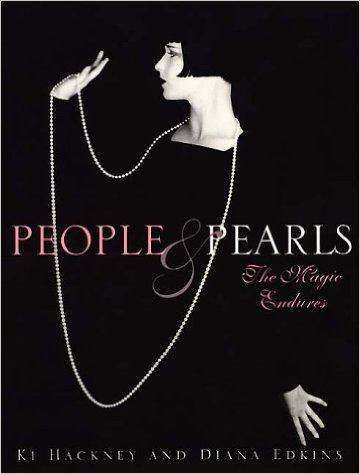 I just picked up a book from the library called People & Pearls: The Magic Endures by Ki Hackney and Diana Edkins, which all of you pearl lovers would appreciate. It has a ton of photos of different women, from First Ladies to heiresses, from royalty to actresses, in pearls. I can’t wait to delve into it more. Getting back to the subject at hand, Sharon’s look reminds me just to pile on the pearls and get on with my day! I love this three-stand version on her and how it just peeks out from under her sweater. I really love the tote, as well as the boots. I do not own a real pearl necklace but have a set of Mallorca faux pearls that my grandmother bought sometime in the 1970s or 80s. My mother gave them to me a few years ago (thank you Mom!) and I went looking for them after paging through the pearl book. I love the golden tone of them and will start wearing them right away. I think Sharon (and Coco!) would approve, don’t you? I love the golden shade of these faux pearls my grandmother purchased in the 1970s (I think). Let me know if you wear your pearls (real or faux) with jeans or if you save them for special occasions. All photos of Sharon by AKM-GSI-Xposure. I have a string of Mallorca pearls I bought in the Virgin Islands more than 30 years ago. Your post reminded me that I need to get the clasp fixed and start wearing them again. Great post and couldn't agree with you more. Let's get our pearls out and wear them!! :-) My mom gave me her short string of pearls she purchased ages ago, when I was a kid some years ago. I used to wear the necklace every single day. Then for my 50th B-Day I received a single pearl pendant from the Mr that I attach to a short gold necklace. Since then I've been wearing it almost every day if I don't wear my mom's pearls. And of course pearl earrings. I wear those, too. So, yes - I do wear (a) pearl(s) every day. I think I should do a blog post some time in correspondence with yours. Or what about a "How I Wear My: Pearls" some day? Great photos of Sharon Stone, by the way! I do like her style here. She looks natural and comfortable and her age. She is a face of an ad campaign of a German clothes company and her pictures are extreme retouched so that she looks like 30, which I think is a real bad joke. I have both, and need to make a point to wear them more often. Love Sharon Stone's whole look here...casually elegant. Sharon has a great look and the pearls are a lovely way to dress up a casual outfit. I wear my pearls a lot! I have freshwater strands as well as the classic cultures sea pearls...I have 2 long opera length strands bit baroque and a short classic choker as well as a bubble gum sized multi coloured strand and a grey freshwater set that are all odd shapes...a Xmas gift from my daughter. So you see I believe whole heartedly on wearing pearls...do not keep them for a special occasion...wear them and feel gorgeous! That's the iconic silent film star Louise Brooks on the cover of People & Pearls. She really rocked the bob hairstyle & pearls. I do wear pearls with casual clothes. Usually pearl studs. I also have a Mallorca necklace that is a silver chain with one large black pearl that I wear constantly. Jill you should wear you Mallorca, and care for them exactly as you would care for real pearls. The method of creating the "nacre" for Mallorca pearls is still kept secret I think? I wear my pearls a lot, and I'm generally wearing jeans, and Lacoste polo tees. Pearls like the light, and humidity; but they don't like sweat. Body oil and sweat is acidic and damages the nacre. Always make sure you wipe down your pearls after wearing them, using a VERY warm wet cloth, and rest them flat to dry overnight on a towel. Pearls and denim...I love the idea. I need to bring mine out ...haven't worn in a while. Thanks Jill! I wear the pearls of my mother every day. So i have always something with me that reminds memy mother. And pearls go with all clothes and in all circumstances. I actually only wear them casually, I find them a bit matronly on me if I'm dressy. I love them tucked into a shirt, tee shirt, or sweater - they look especially great with a light blue chambray work shirt I think. Yours are beautiful and from your grandmother - wear them! Hi Une Femme, I'm with you, Sharon's casually elegant look is perfect! I am going to try to channel her sartorial energy this weekend and just add a strand of pearls. Hi Rosie! Your Mallorca necklace sounds amazing! And yes, doesn't Louise Brooks look gorgeous in that book cover photo? She is definitely in my Bob Hall of Fame. In fact, I think she has to be the founding member, what do you think? Hello Duchess of H, thank you SO much for the pearl lesson! I didn't realize I should care for the Mallorca like a real strand. And I think you are correct that the method for making Mallorca pearls is a secret.